Fit for a crowd and just as tasty the next day — leave it to the Queen of Italian Cuisine to bring us a cold weather comfort food favourite. 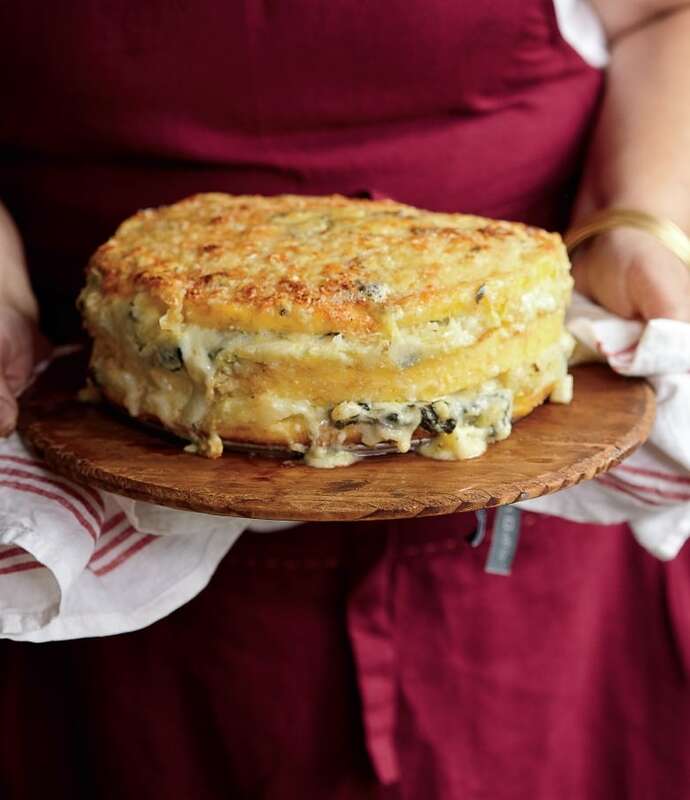 When we were flipping through the pages of Lidia Bastianich’s new cookbook, Lidia’s Celebrate Like an Italian, and noticed this ultra cheesy, cabbage-stuffed polenta torta, it took us a few moments to recover. Make-ahead, fit for a crowd and just as tasty the next day — this decadent dish is the very reason to gather your friends for dinner at yours this weekend. This is an ideal preparation for a crowd. You can assemble the tart the day before and then bake it the day of your gathering, and it also reheats well. It’s delicious with Gorgonzola and cabbage, but you can vary the filling in this torta however you wish. I love vegetables with polenta but you can treat this cake like a pizza and stuff it with sliced grilled sausages, mozzarella, and some tomato sauce to moisten the filling. I also like using a leftover ragù or a combination of other sautéed vegetables with the potato-and-cheese base. Save the extra sauce and serve it on the side when slicing the torta di polenta. In a large saucepan, combine the water (or water and milk), olive oil, bay leaf, and salt, and bring to a simmer over medium heat. Very slowly, sift the cornmeal by handfuls into the pot, through the fingers of one hand, stirring constantly with a wooden spoon or whisk to remove any lumps. Once all of the cornmeal is added, adjust the heat so just a few lazy bubbles pop to the surface. Continue to cook and stir until the polenta is smooth and thick and pulls away from the sides of the pan as it is stirred, about 30 to 35 minutes. Discard the bay leaf. Butter a 9-inch round cake pan. Pour the just-cooked polenta into the greased cake pan. Let stand until cool, then refrigerate until completely chilled, about 4 to 5 hours. When the polenta is firm, preheat oven to 400 degrees. Butter a 10-inch, 4-inch-tall springform pan, coat with bread crumbs, and shake any excess out of the pan. Put the potatoes in a large saucepan with ample salted water. Bring to a simmer, and cook 5 minutes. Meanwhile, remove any wilted or yellow leaves from the cabbage and cut out the core. Cut the cabbage into 1-inch chunks. Add these to the pot with the potatoes, and cook until both vegetables are tender, about 15 minutes more. Drain the vegetables thoroughly. In a large skillet, heat the oil over medium heat. Add the thyme and garlic, and cook until garlic is just golden, about 2 to 3 minutes. Add the cabbage-potato mixture, the salt, and the pepper flakes. Cook, turning the vegetables occasionally, until the liquid is evaporated and the vegetables begin to sizzle. Mash the vegetables coarsely with the spoon as you turn them, leaving plenty of lumps. Be careful not to scorch the mixture — just cook it until the liquid has evaporated. Remove the garlic cloves (if they haven’t mashed into the mixture) and discard. Invert the cooled polenta cake onto a cutting board. With a long, thin knife, slice the cake into three even horizontal layers. Place the top layer upside down in the bottom of the buttered 10-by-4-inch springform pan. Top with half of the potato-cabbage mixture and half of the Gorgonzola. Top the cheese with the center layer of polenta, and top that with the remaining potato-cabbage mixture and Gorgonzola. Place the bottom layer of the polenta cake upside down over the torta and press gently. Brush the top of the torta with the 2 tablespoons butter, and sprinkle with the grated Grana Padano. Bake the torta until the top layer of cheese is lightly browned, and the torta is heated through, about 40 minutes. Remove, and let cool 10 to 15 minutes. Remove the sides of the springform pan, and cut the torta into slices to serve. Excerpted from Lidia’s Celebrate Like an Italian by Lidia Matticchio Bastianich and Tanya Bastianich Manuali. Copyright © 2017 by Tutti a Tavola, LLC. Photography by Steve Giralt. Published by Appetite by Random House®, a division of Penguin Random House Canada Limited. Reproduced by arrangement with the Publisher. All rights reserved.